There is no support for the specification. The DoD CIO is not updating or supporting DoDAF documentation. The IDEAS group is defunct. No one is maintaining DM2. The website udpmgroup.org is for sale. See http://www.omg.org/syseng/UPDM.htm. The specification appears to be generated from a model, and is way below the quality standards for other OMG specifications. Figure 8.1 on page 23 has two symbols for the same element: InformationAssuranceProperties appear twice on the diagram. One instance of the symbol would suffice. One or more clients of No Magic Professional Services seek to be able to model the systems, services, test case behaviors, test data, and so forth of the verification and validation of their UPDM-specified Systems and Services. These clients are already using SysML within UPDM for their Requirements engineering and for their Systems Viewpoint modeling. SysML delegates Verification concerns to the UML Testing Profile via SysML's <<verify>> Relationship between Requirements and Test Case activities. These clients of No Magic ask that No Magic champion the integration of the UML Testing Profile-or any other standardized set of concepts-into UPDM. A tool that is DoDAF conformant should encourage the user to fill in the Authoritative Source field whenever they define a new architecture element (AV-2). The Authoritative Source should provide specific locator for the source of the term and definition. Multiple AS may be occur. Almost every JIE architecture gets a comment from JS J6 that the AV-2 is missing the Authoritative Source for the term and definition which they say is a DoDAF conformance requirement. The problem they’re really getting at is the proliferation of inconsistent AV-2 terms even in a single project like JIE, even worse across all the mission areas. The number of AV-2 terms in the WMA repository is in the tens of thousands if not more by now. Mapping, reconciling, adjudicating, etc. is impractical. Their approach is to encourage reuse of terms to encourage standardization, e.g., the Joint Common System Functions List (JCSFL), JCAs, UJTLs, … Everyone agrees but the AV-2 Authoritative Source fields remain blank – once the toothpaste is out the tube, very hard to get back in. Capabilities vs Activities. As you know, the DM2 Capability model is built about the JCIDS definition and centers around effects (resource states) that are measureable (have metrics so you can tell if they've happened) and is produced by ways (Activities) and means (Performers) under specified Conditions (i.e., PMESII, DIME). Thus they are quite a bit different from Activities which transform inputs to outputs or change their state. Many comments are being generated and much argument and rework because many CV's are missing pieces or are clearly Activities being described, not Capabilities. For example, I just turned in a comment on the IdAM RA on their CV in which they defined the Capabilities in terms of their Inputs, Controls, Outputs, and Mechanisms – ICOM – the exact prescription for Activities in IDEF0. Note that a PES file that did not have the required pieces and that claimed to contain CV information would fail validation. Also note the DoDAF-DM2 formulation of CV's fits the JCIDS-DAS-SE processes by linking ICD threshold and objective attributes and CDD/CPD KPP/KSA/OSA to the CV's and to the T&E process by aligning the architecture and JCIDS documents to test metrics. This method was also designed to allow flow down of operational metrics (MOEs) to SV/SvcV (e.g., SV-7) metrics (MOPs). It also aligns with training since UJTL tasks have measure types (several defined per task), UJTLs map to JCAs, and JCAs are the organizing construct for ICD attributes and are also required in CDD/CPD. There are probably many other elements of architecture and systems engineering that align by defining Capabilities the way we did in DoDAF. DoD CIO A&I and Joint Staff J6 are in very close agreement on all this. This issue relates to the readability of the specification on the various "view diagrams", DoDAF elements are left of off these diagrams it becomes hard to recognise which diagrams use specific DODAF elements, it is only through understanding what things have DoDAF aliases that you can see what needs to be added to the correct diagram. These elements need to be added to the diagrams that they can participate in by showing the MODAF elements that they alias/inherit properties from. The term NodeRole is more applicable to MODAF than DoDAF and does not derive from Performer, Ron Williamson sugested PerformerRole. There are other terms that could be affected in the this way like NodeOperation. Even though I understand the need, I am against creating more Stereotypes that are Aliases for DODAF. It becomes harder to maintain and more problematic for implement. I would suggest that we rationalise the name of the stereotype for instances of Nodes/Performers to be aligned with both MODAF and DoDAF, i.e. OperationalNode. Desired affect targets "state" in UPDM 2.1, states must have a context and this causes the architects to think too low down in the model (at the OV and SV level) where implementation exists. Desired affect needs to be tied to something in the CV/Stv that is not a "state", called Effect in the CV/StV. Why does a user need to build an SOV-3? Why does a user need to build an SOV-3? The relationship from services to capabilities should be transitive. Once a user establishes traceability from operational activity to capability and from ServiceFunction to Operational Activity, then there is already a trace from owning service (service that owns that ServiceFunction) to a capability and SOV should b au-populated. Further, a service(Interface) should map to a node and not to an OperationalActivity or to SystemFunction. This change is to be discussed with respective requirements representatives. Why are rules in OV-6a and SV-10a not parsed? Why are rules in OV-6a and SV-10a not parsed? They need to be specified as OCL constraints. Similarly for SOVs, use OCL to define performance level supported by each provider to each type of consumer as in a Service Level Agreement (SLA). Information Exchange (IEs) item or element: Currently all IEs are defined as elements of package AllView. This should not be the case. There needs to be a distinction between Operational View IEs and Systems View Exchange elements. Discussed Resolution: Currently in MODEM, only InformationElement flows are allowed in OVs (see below). MODEM will use FlowedElement instead. Will consider changing its current type from abstract to make it a typed generic flow defined in OVs. An abstract ResourceType is defined for SVs. It will have as subtypes: human, non-human etc. as shown below. In addition, subtype InformationElement will be moved from current location to be a NonHumanResourceType defined in SVs. Allow any of the SV ResourceType leaf level elements (e.g. NaturalResourceType) to trace back to OV flows. Information flow instantiation. There is no UML construct to define flow and then to instantiate flows to use flow types and then flow instances that flow between two instances of two things. Typical and actual posts, etc. should be introduced and defined in SV-1 as they are the human equivalent of systems, capability configurations, etc. It is in SV that we provide a PSM/white box/logical design model where we introduce elements (human as well as materiel) that are to be allocated to the problem domain described in OV. Resolution discussed: introduce roles in SV-1 and allow them to relate back to OV-4 organizations that will provide them. Checked this in MODEM. Below is how it is currently defined. Why is EnterprisePhase to EnterpriseVision a one to one relationship? Composition relationship is also not needed. 	change relationship to: one to many on EnterprisePhase end and 0..1 on EnterpriseVision end. Please enter this issue against UPDM RTF 2.2. In UPDM 2.1 we are missing capability to decompose Enterprise Goals, e.g. goal, objective pattern supported by BMM. This capability is already available in MODAF 1.3 witch UPDM claims to support. OV-6b	OV-6b State Transition Description	DoDAF: The Operational State Transition Description (OV-6b) DoDAF-described View is a graphical method of describing how an Operational Activity responds to various events by changing its state. The diagram represents the sets of events to which the Architecture will respond (by taking an action to move to a new state) as a function of its current state. Each transition specifies an event and an action. OV-6b Operational State Transition Description MODAF: OV-6b: The Operational State Transition Description is a graphical method of describing how an Operational Node or activity responds to various events by changing its state. The diagram represents the sets of events to which the Architecture will respond (by taking an action to move to a new state) as a function of its current state. Each transition specifies an event and an action. b. For those that are to be Built, or are to be Bought, model the the Services Views to identify (conduct an analysis on what is available within and outside enterprise), and identify the contractual Service-Level Agreements and indicate the Service orchestration with the Enterprise's Performers. ii. For services to be outsourced stop detail here (services view) but show they are used in systems view (via service request interfaces for system components. 6. Develop Systems Views and then map (system) Functions to Services and Functions to Operational Activities. Currently, one has to use ActualProject and ActualOrganization to get an organizational to project mapping. Why not organization and project types? Understand this theoretically, (only a “real” organization can undertake a “real” project), however what if the architecture description itself was all a pattern? I should be able to associate classes of organizations (a type) with classes of projects. Profile then defines the following: (this is probably true for all elements that are aliases). There is a constraint stated in Figure A.30 of the dtc/12-12-17 specification such that in MODAF (and therefore NAF), the MapsToCapability relationship is precluded from using OperationalActivities and is prescribed to only use StandardOperationalActivities. This has resulted in defining another relationship in the spec called ActivityPartOfCapability for DODAF, that creeps into MODAF and NAF in vendor implementations, to allow one to associate an activity with a capability for the purposes of generating traceability diagrams and for generating NPV-2: Program to Capability Mapping (through Activity is part of project, and Activity is part of Capability). There is no need for both and it is redundant and a possible source of model inconsistencies to request the architect to define both MapsToCapability and another called ActivityPartOfCapability. Further, the MODAF constraint to use only StandardOperationalActivities when mapping to capabilities for the purposes of (MODAF policy?) can be accommodated in another manner. UPDM includes a <<Property>> stereotype with properties maxValue, minValue and defaultValue. <<CapabilityProperty>> specializes the Property stereotype and extends the Property metatype. 1. could you rename the Property stereotype to avoid confusion with the UML metatype of the same name? 2. since the UML metatype Property already has a defaultValue, could the UPDM one be removed? These impact XMI (see MIWG TC22). According to the definition of ProjectSequence, "MODAF: Asserts that one ActualProject (MODAF::Project) follows from another - i.e. the target ActualProject cannot start until the source ActualProject has ended. DoDAF: NA". The restriction "...cannot start until the source ActualProject has ended..." precludes practical project management. In practice, projects can have a partial ordering yet not be strictly sequential. Projects can overlap each other in time, occurring partially contemporaneously. One sees, in a common tool such as Microsoft Project, the ability to specify Start to Start, Finish to Finish, Start to Finish, and Finish to Start offsets. Recommended Remedy: Enhance Project Sequencing to support SS, FF, SF, and FS offsets between prior and next ActualProjects. The kind of offset and the duration of the offset would each be Tag Values of ProjectSequence. In the current DoDAF Project Viewpoints (PV1) the project element has a start date and an end date. Those attributes are not sufficient for the US JCIDS process. In the incremental development process described by JCIDS, we have increments, blocks and spirals. In the main we don't measure our programs in absolute start and stop dates but rather where they fall in the relative JCIDS process, priority and lifecycle. Start dates are usefull but with a 20-30 year lifecylce, the stop date is not as useful. Having these attributes (increment:string, block: int and spiral:int) in the Project Element would allow us to trace requirements and capability sets to the proper increment, block or spiral. As shown in Figure 8.127 for CapabilityConfiguration to PhysicalArchitecture and Figure 8.130 for PhysicalArchitecture to SystemResource and in Figure 8.178 for System to ResourceArtifact, Figure 8.132 for ResourceArtifact to PhysicalResource, Figure 8.131 for PhysicalResource to SystemResource, one can see that System and PhysicalArchitecture are sibling concepts. The consequence of this is that a self-contained System cannot be the Classifier of a FieldedCapability. That is, a FieldedCapability cannot be an instance of a System. I claim that it is convenient to be able to specify that a FieldedCapability is an instance of a self-contained System. Having to model a separate CapabilityConfiguration to wrap just the System so that one can instantiate a FieldedCapability that is an instance of the System seems onerous. The recommended remedy is to allow a System to be a proper CapabilityConfiguration in addition to being a property of a CapabilityConfiguration. The user community (including MITRE, Raytheon, Intercax, and professional services architects such as No Magic staff) requests that UPDM integrate the Requirements, Constraints, and Parametric Blocks into UPDM. Then, Enterprise Architects using UPDM can perform their systems and econometric analyses and their requirements engineering with their UPDM models that they can perform today in SysML modeling. Of the available DoDAF Service concepts, neither ServiceAccess nor ServiceDescription is an adequate concept for expressing collaborations of multiple Services such as one does in a SOA ServiceArchitecture. The lack of a concept like HighLevelOperationalConcept, say "ServicesOrchestration" or "ServicesCollaboration", for the SvcV-1 makes it difficult in UPDM DoDAF to model SOA Service Architectures. One has to borrow an instance of concept called "ServiceAccess"-which is poorly named and which suggests the means of accessing a single entity-and then claim that the borrowed ServiceAccess instance is really only an abstraction for representing a particular instance of an orchestration of multiple Services. One names it with its type as, say, "Service Orchestration for Situation X : ServiceAccess", and then uses its StructuredClassifier and its BehavioredClassifier natures in order to draw the orchestration of multiple ServiceAccess properties just as one uses UML's composite structures metamodel to model similar collaborations for Highlevel Operational Concepts, Systems Internal Interface Descriptions for systems collaboration in CapabilityConfigurations, SysML IBDs, and etc. ServiceDescription is a derivation of ArchitectureDescription that is, itself, an extension of Package. The intended purpose of ServiceDescription is for the documentation of the purpose and of the elements of a Service. Because of this documentary intention and because Package is not intended to be a suitable metaclass for the modeling of composition hierarchies, ServiceDescription, too, is not appropriate for the concept here called "ServicesCollaboration". Recommendation: either add <<SOAML::ServiceArchitecture [Collaboration]>> directly into UPDM or add <<UPDM::ServicesCollaboration [Class]>> to UPDM so that one can model Services in Composite hierarchies like they can model conceptually similar collections of parts in contexts in other notations. SBVR, the Semantics of Business Vocabularies and Business Rules, provides a formal logical foundation for the expression of enterprise ontologies and rule constraints applicable to enterprise elements. SBVR also offers informative, non-normative notations for these vocabularies and rules. Future increments of UPDM (i.e. UAFP v1) should not preclude an enterprise architect from using SBVR and its metaclass elements for the expression of ontologies and rules within their UPDM (to be known as UAFP) models. These enterprise ontologies and enterprise rules appear throughout a traditional UPDM architecture description in the structural elements of the respective views (e.g. Performers, Operational Activities, Systems, Services, etc) and in the constraints on those elements. In UPDM 2.0 Exchange Elements emerged from Information and Data Elements used in UPDM 1.x. They can still be classified into information and data indicating different levels of abstraction. However, one cannot be connected to another as it used to be in UPDM 1.x. In other words there is no way to relate data to information. In UPDM we are missing capability to differentiate between Logical and Physical Services. Note that this capability is already supported in DoDAF. It is also supported in other frameworks such as TOGAF etc. In UPDM it is mixed up and not clear enough what kind of services we are allowing to define. If we use services in SVs, we suppose to have physical services. If we are using services in OVs, we suppose to have Logical (Business) services. Having a normal logical/physical pattern we are already using in UPDM, we should be able to have traces between the two. Unfortunately we cannot differentiate between logical and physical services. It implies we cannot have two different levels of details when we are dealing with services. And we are forced to do services in either Operational or System viewpoint, but not in both. An import use of architecture is to provide sufficient information to guide the design and implementation that realizes the architecture in the actual solution space. By definition, architecture dictates neither the design nor the implementation that realizes it, though this boundary is often blurred to a certain degree by a particular organizations methodology or pragmatic need of a projects. Transformation into constructs used in design and implementation workflows, e.g. Code Skeletons, XML Schema, etc. Supporting the expression of test cases and declarative expressions of architectural instrumentation for such purposes as monitoring and analytics. In this particular issue we focus on the SvcV-1 and SvcV-2, which would be the natural place to specify the actual SOA related elements. The following diagram provides a context from an external, classifier derived perspective. The issue submitter acknowledges that there are arguably some other ways to represent services, given such constructs as ServiceFunction, etc., but the method depicted above “feels” more accurate and aligned with downstream design and implementation, especially in the context of UML that might be used by teams independent of UPDM. In conclusion, the issue submitter, along with project colleagues, wish to have a useful set of mechanisms/metamodel constructs that allow the expression on services, their interactions and the flow of data between them at the PIM/Logical level using, logical data captured as EntityItem that details conceptual data captured as ExchangeElement. This would allow direct traceablity from conceptual interchange expressed at the OV level with how it is addressed at the SV level. In simpler terms, when two activities exchange information at the business process level, we can easily find how this conceptual interaction is realized as SOA services. Once establishing this in the model we can then hand it off to design and implementation workflows in a more accurate, traceable and useful architectural specification form. Significantly, such and architecture might prove much more fit-for-purpose for model related practices, transformations and automations involving the instrumentation, simulation and observation of the architecture in its solution realized forms. Also tests might be expressed more tightly. Part of the resolution would be related to the fact that and ExchangeElement is subtyped from ResourceInteractionItem whereas EntityItem is subtyped from Class. The result is that a logical data structure captured as an EntityItem cannot be the conveyed item in a ResourceInteraction. We would either need to revise the metamodel related to ResoureInteractionItem or add some new construct, say something like DataInteractionItem and DataInteraction that could be used to express the flow of logical data, which the issue submitter models using EntityItem in DIV-2 package structures. There are related traceablity issues that will the subject of further submissions, however, this submission focuses on the essential part of expressing the set of SOA ports, interfaces and data flows in an architecture. Simplify measurements in UPDM and make measurement compatible with SysML unit, value, and parametric constraint. See diagrams below. No need for measurement set. Expand general activity modeling for all UPDM constructs to include representation by action, callBehaviorAction and callOperationAction. Please enter issue against UPDM RTF 2.2. Allow ( OperationalActivityAction, ServiceFunctionAction, ProjectActivityAction and FunctionAction ) to be represented as either CallBehaviorAction, CallOperationAction or Actions. Currently only CallBehaviorAction is allowed. While the proper implementation of a UPDM 2.0 Profile assures successful exchange of data models, the exact content of the VIEWS remain non-normative. There needs to be a definition of the minimum data elements to support each view as well as optional data elements. The UPDM RTF Group needs to discuss whether all (52?) Views need to be made NORMATIVE, how to support Optional data, and how to support the required USER-DEFINED VIEWS. I really need "Desired Effect" reinstated. This will act as the "Objective" in my strategy models. This was available in UPDM 1.0 now it's gone. This is actually very important to modeling a strategy. However, when or if you can bring it back, it previously provided the output link of "Realizes Vision". That is wrong. It needs to "Realizes Enterprise Goal". It's the Enterprise Goals that realize the Mission. And it's the Mission(s) that realizes the Vision. DoDAF 2 contains rules that indicate that superSubtype relationships can be formed between any type elements of the same kind. The same rule applies for wholePart (betwen individuals of the same type) and WholePartType (between types of the same kind). In UPDM terms this would correspond to Generalization as well as property handling. There are not enough stereotypes defined within UPDM 2 to allow these rules to be followed. This either needs to be rectified or a general statement made within UPDM that allows the use of the appropriate UML relationships to accomplish this. Currently UPDM does not map a numer of elements that exist in DM2, namely those above the Type level, for example CapabilityType since UML does not support elements at higher type levels. There is however a possibility of doing this by recognising that a set of capabilities (as an example) contains a given capability instance but capability categoreis are really a larger subset of available capabilities. This would make it possible by allowing the elements to contain a tagged value that indicates whether they are to be considered at a higher type level. This would make it possible to provide a mapping between more DM2 elements and UPDM elements than currently possible. It is assumed that a tagged value would be easier to handle than the introduction of additional stereotypes since categories would imply elements with different stereotypes inheriting from one another. This would be an element that is the equivalent of the MODAF element ServiceLevel and would contain slots and instance values for the properties that have been defined for ServiceInterface. There would be a need to provide a tagged value to any usage of the ServiceInterface as a port either on a NodeRole or ResourceRole where the actual service interface would be indicated that is to be viewed as a requirement for this particular context. For the port used on the ResourceRole there would also be a need to indicate how many instances of the actualServiceInterface that the ResourceRole would need to accomodate, at least if a complete mapping to between MODAF and UPDM is to be achieved. (All of this actually exists already as part of the MODAF model that UPDM is supposed to implement). When the specification is generated, the generator should emit cross-references for references to model elements throughout the text. For IT and systems engineering experts who are not familiar with military matters it is unreasonably difficult to understand the title of this standard and its significance for IT and systems engineering in general. Action:-These subheadings are in the OMG template and from reviewing other PAS submissions it reveals that these documents have been submitted to ISO using the same format. In case of UML, inheritance is described as “Generalization” in texts. However, in this document, inheritance is described as “Specializations”. It is confusing. Unify the representation style for the inheritance, that is, decide which representation is taken. Although the relationship is called generalization in UML, the term is dependent upon the direction from which the relationship is being viewed. If taken from the perspective of the element which is the is focus of a specific diagram (which is the case in this specification), the term used is specialization. UPDM v2.1 is specific to DoD and MOD procedures. "UAF" written in the explanatory report should be made an international standard. 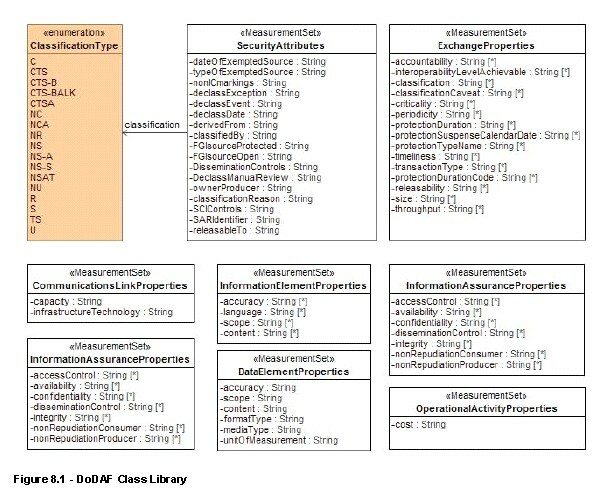 The UPDM classes are defined using class diagram and those descriptions. Some class diagrams specify association link. However, there is no description for association as text.. The OMG Architecture board did not require this level of detail in the documentation so it was not added. This clause describes the class library using class diagram. However, there is no class definition for each, that is, there is no attributes description and association description. According to the explanation, the “Partitioning” is the package. However, I couldn’t find the packaged diagrams except for the “Aliases”. It seems that it is necessary to define UPDM using Package diagrams. Replace the Pertitioning section 7.3 with the following. Partitioning: The UPDM profile is organized as a number of hierarchical packages that are used to group elements, and to provide a namespace for those grouped elements. The top level structure of these packages can be seen in Figure 2.2. (Packages are represented in the diagram by a rectangle with a tab in the upper left hand corner). This document refers to “DMM” which is defined as non-normative Annex A. However, it seems to be Normative. Besides, according to the text, it is necessary to refer to the colour legend. However, I couldn’t find the legend. Clarify this sentence. If those were Normative, move DMM to the body parts. add colour coding legend and explanations. The DMM is intended to be informative and was used to develop an understanding of the foundational concepts from which the UPDM profile evolved. It remains useful for understanding the architectural concepts required to implement UPDM. It is expected that UML and SysML tool vendors who implement UPDM would implement this profile rather than the DMM; however, it is possible non-UML tool vendors may wish to implement UPDM in their by tool by following the DMM. In annex A delete the second paragraph starting “Note that the” and replace with the text and diagrams below. Note that the diagrams rely on color to aid the reader in understanding the model. Please refer to the legend below to understand the diagrams. The following is the legend of element colors used in the DMM and what they denote. The “UPDM RFC” suddenly appears without a definition or a reference. It seems that this RFC is meaningless. This sentence is informative. It is obvious matter to follow the RFC. Remove the description which mentions the “RFC”. Or if the RFC is inevitable, it is necessary to reference to RFC or remove the RFC. This International Standard reuses a subset of UML 2 and provides additional extensions needed to address the requirements of developing UPDM. We have used those requirements as the basis for this International Standard. Some of text should be merged into the scope Clause 1. This specification will be of interest to end users, military, industrial and commercial, who expect to use this profile, and to tool vendors interested in developing tool support for the development of enterprise and system of systems architectures. DoDAF and MODAF are formally expressed as domain-specific meta-models known as the DoDAF Meta Model (DM2) and the MODAF Meta Model (M3) respectively, this provides the foundation for the UPDM domain metamodel and profile. There is also a set of viewpoints and views that address the concerns of a well-defined set of stakeholders. This specification organizes the presentation of the UPDM 2.1 abstract and concrete syntax around the meta-models, with effort made to establish a maximum set of common Core models and a minimum set of DoDAF DM2 or MODAF M3 specific models. Significant effort has also been made to continue to support the now over 50 viewpoints that can be derived from these meta-models as well as "user-defined views". This allows tool-vendors to specify views, based upon a common metamodel that are more applicable to industrial and commercial concerns than just military, it also ensures that the discussion is well-connected to the domain experts required to produce these views. (See Section 1.5 for a more detailed description. )"The rest of this document contains the technical content of this specification. As background for this specification, readers may wish to review the UML, OMG SysML, and SoaML specifications that complement this specification. No new terms and definitions have been required to create this International Standard. All terms should be available in the normative references or bibliographic citations for detailed explanation. Any additional terms created to implement UPDM have been defined within this standard. The clause 3.4 describes the DoDAF 2.02 Conformance. However, the “Compliance” is already described in clause 2. The structure is confusing. Don’t separate the “Normative Reference” clause. Existing ISO standards should be mentioned. IS0, TC154 should be ISO/TC154. 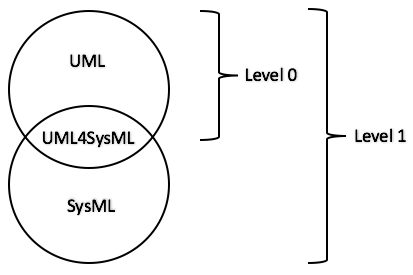 UML2.3 should be changed to UML 2.4.1unless there is inevitable reason, since UML2.4.1 has been standardized as IS. Response:- At the time the standard was published UML 2.3 was the current version of UML. A change to UML 2.4.1 would invalidate the references to UML in the XMI resulting in a major change to the standard. It is envisaged that a major release i.e. UPDM 3.0 aka UAF 1 would update the references to the latest versions of UML and SysML available. The last bullet point is broken. Figure is a little grainy. The first sentence may invite misunderstand that “UPDM 2.1” and this standard are different. The scope of this standard focused too much on the use of DoD and MOD area. Action:- We modified text in the scope section. What allows (arrows) in the diagram do mean? Are they support or consist of UPDM? Add the definition for NAF in clause 5. As stated in the clause 6.2, this standard intends to facilitate end user who want to communicate with DoD and MOD. If so, this standards need not to be an ISO or ISO/IEC standard. Figure number is incorrect in Subpart 1.